Are you looking to upgrade your existing fireplace or install a new one, either for purely aesthetic purposes or for a more functional solution for heating your living room? At HomeTrends we have a very wide choice of contemporary style fireplaces to choose from. At HomeTrends, we sell beautifully designed modern fireplaces that are developed specifically to use bio ethanol fuel. 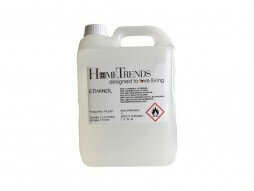 Bio ethanol fuel is a clear liquid that is clean burning and smoke free.